Hi Dear readers. Hope you all are doing well. Yesterday when I posted a picture of this Chocolate cake with Oreo frosting on my instagram, I promised you all to post the recipe on my blog, so her it is. 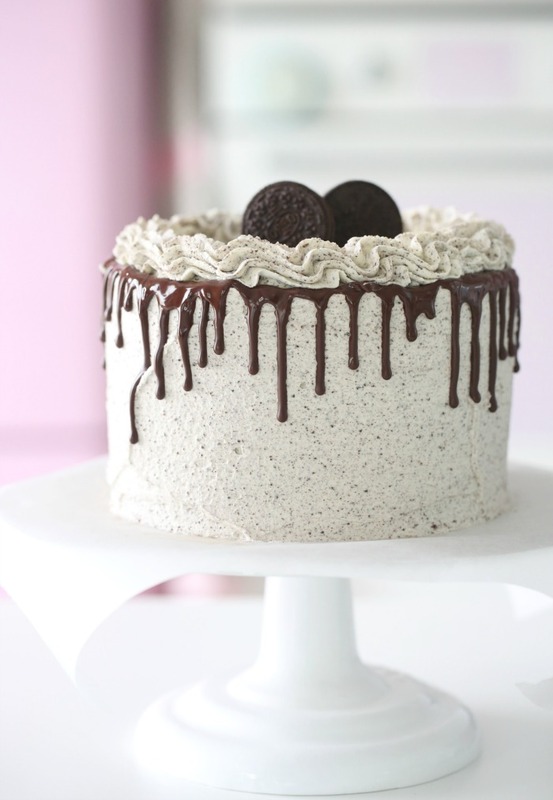 This chocolate cake, is filled with chocolate ganache and the most delicious oreo frosting. This frosting is so heavenly to eat and best of there is no butter in this cream, making it so light and delicious. Here, comes the recipe, enjoy! Preheat the oven to 165 °C. Grease 3 x 8 – inch round cakepans, and put parchment in the bottoms and set aside. In en large bowl, sift all-purpose flour, cocoa powder, baking soda, salt and baking powder and set aside. I en bowl of a standmixer, attach with the whisk attachment, whisk the eggs and sukker for 5 whole minutes. stop the mixer and with a spatula scrape the side and the bottom of the bowl, and contentiou mixing for 5 minutes more. add the mayones, and mix just until combine. Sift in the flour mixture in two parts and the coffee in two parts and, and combine it with a spatula. Divide the batter into the three baking pans, and bake it in the center of the oven for around 30 minutes. Let the cake cool on a wire rack, take them out of the baking tins and let them cool down completely. If you want to have ganache in between the layers, you can find the recipe her. In a bowl of a stand mixer, attach with the whisk attachment, Whisk the heavy cream, mascapone, powdered sugar and vanilla paste for about 3 minutes, The consistence should be fluffy, like it is on the picture below. Use a sift and sift the crushed oreo cookies, so you dont get big chunk of the oreo cookies in the frosting. With a spatula, just combine. Have a taste it is magical. I use a high spring-form and put the first cake layer in the bottom, add a few spoons of gananche, and top it with oreo frosting, repeat with the next layer, When you add the last layer, add some ganache on top, covered it with plastic wrap, and have it in the refrigerator for at least 2-3 hours. Cover the rest of the cake with Oreo Frosting, starting on the top, and moving to the side, I just use an offset spatula for this. I love this cake just like this, but, I have seen some Cake with chocolate dripping of on the side and wanted to try it out, I use ganache and warm it slightly and put it in a piping bag, I did not like the look at all, but more chocolate is always good if you ask me. To do the dripping effekt, just put the ganache in a piping bag, cut of the end, and just go all the way around the side of the cake, and press out chocolate. I lost a little inspiration because i did not like the dripping effect, but at least i got to try it, but the cake itself was super delicious. Enjoy this cake with a delicious cup of tea and enjoy! We miss you on snapchat Manuela ❤️? when it comes to the heat it is difficult to say, because when I have been in Dubai to bake, everything melt so quickly so difficult for me to say yes and no! Hi, I am planning to make this cake for mt father’s birthday soon. I have question regarding one ingredient from the list – mayones. Is that mayonnaise? Hi manuela,is there any substitute for mascarpone?thank u.. Yes just use cream cheese! Hi Manuela, what can i use as a substitute to the coffee as I am making this cake for children? Just leave out the coffee and use just water! Skulle ønske du ville legge ut oppskriftene dine på norsk??? ?